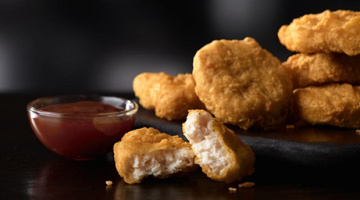 McDonald’s McDonald's® tender, juicy, Chicken McNuggets® are made with USDA-inspected white meat. They're tempura battered and cooked to golden perfection. Step up the fun with your choice of our delectable dipping sauces. Get 20 pieces for only $5 today!